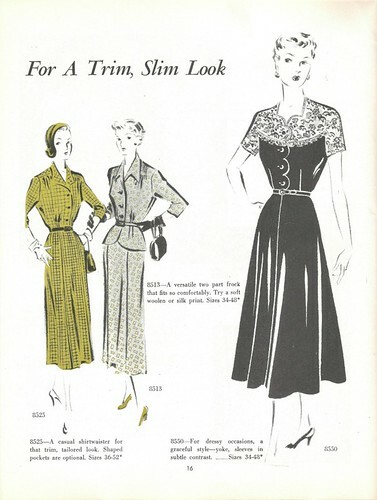 Here are two more pages from Fashion: Fall-Winter 1950 for your enjoyment. I just love all of the scalloped edges. And that contrasting lace yoke just gave me an idea for another version of my latest creation . . . The neckline of 8620 reminds me very much of the jacket from Vintage Vogue 1136. And that feathered hat is truly fabulous. How do get into a car with something like that on your head? Does some lucky person have any of these lovely Sew-Rite Patterns? And does that mean that you have one of these lovely outfits in your closet?! Thoroughly enjoyed, thank you very much sharing these great pages. 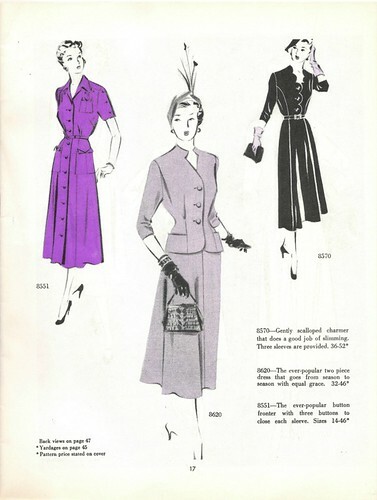 Late 40s/early 50s fashions a perpetual favourite of mine. You find the most awesome things! I would happily make/wear both of those.